Thalassery Biryani is one of the popular biryanis of Kerala. This is a pakki (cooked meat) type of layered biryani kept under dum and served. This biryani is prepared using a special type of flavourful rice called Jeeragasala/Jeeraga samba. The rice is cooked separately by following reduction method. There will not be any extra water drained. This biryani varies from other biryani, it has not masala powders like turmeric, chilli powder or coriander powder in it. In this biryani instead of yogurt, tomato and lemon juice are used to make the biryani masala. The addition of rose water gives more flavour and dimension to this biryani. It is a kind of less spicy biryani with rich in ghee, cahews and raisins. 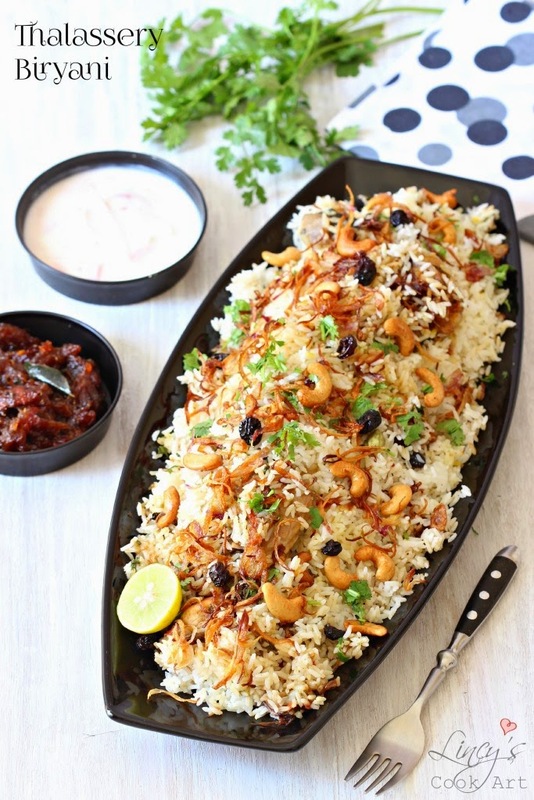 Thalassery biryani is served with mildly spicy and sweet Dates Chutney. Jeera-1 teaspoon shahi jeera-1 teaspoon, fennel seeds- 1 teaspoon, cinnamon- 3 big bark, cloves- 1 teaspoon, cardamom-6 nos, Mace-3 and Nut meg- 1/2 slightly roasted and powdered. Heat ghee+oil (vanaspathi) together in a pan and add the thinly sliced onions and fry till golden colour. I have fried in two batches. Remove them from ghee and add the cashews, once they starts to get golden colour add the raisins and fry toghter in the oil till it puffs up. Remove them from ghee and keep with the fried onion. Grind the ginger, garlic and green chillies together as a coarse paste. (You could do separate too). Add the onion fried remaining ghee inside the heavy bottomed deep pan. Add the paste and cook in that ghee till raw flavour leaves. Now add the chopped tomato and cook till soft. Add the chicken and salt; Cook in the masala for a minute and add some coriander and mint leaves. Then add a teaspoon full of garam masala and mix well. Add half a cup of water and close with a lid and cook the chicken till soft. Switch off the gas and keep aside till the rice get cooked. On top of chicken masala drizzle some lemon juice. Add half of the fried onion, some cashews, raisins and some chopped coriander and mint leaves. In a glass take half a cup of hot milk and a tablespoon of rose water and add some saffron strands. Allow to soak for 5 minutes. To make the cooked rice, take 6 cups of water and add rose water, a teaspoon of ghee, cinnamon, cloves and cardamom. Now wash the rice and add straight away and add some salt to cook the rice. Add 1½ cups of water for a cup of rice to cook. I have added 6 cups of water for 4 cups of rice to cook. Allow to cook the rice on low flame as it tend to catch at the bottom. Cook the water by reduing method do not drain any water. When the water almost evaporates the rice is 80 percent cooked. Layer the hot rice straight away on top of chicken masala. Sprinkle some of the fried onion, fried cahews and raisins, chopped coriander and mint leaves and some garam masala. Take 3-4 teaspoons of onion fried ghee and sprinkle on top of rice using a spoon. Sprinkle half of the saffron milk with rose water. Again layer half of the remaining hot rice and spread evenly. On top of that add some fried onion, cashews, raisins, coriander and mint leaves and sprinkle some garam masala powder. Sprinkle 3 teaspoons of onion fried ghee over the biryani. Drizzle the saffron milk over the last layer and close with a lid tightly without any gap and keep some weight on top and cook the biryani under dum for 15 minutes. If the flame is low you can keep straight away. Otherwise keep a flat tawa once it becomes hot transfer the biryani vessel on top of that and cook for 15 minutes. After 15 minutes open the biryani vessel and dig from deep down and serve with rice and the chicken masala from down. Sprinkle some fried onion, cashewa and raisins. Serve with the Dates Chutney.